The New Breadmakers is the long-awaited sequel to Margaret Thomson Davis' bestselling saga The Breadmakers - her classic trilogy chronicling the life and times of a Glasgow working-class community during the 1930s and '40s. Having survived everything that the Depression and the Second World War has thrown at them, the people of McNair's bakery and the surrounding tenements are now facing an uncertain future. With the Coronation of 1953, a new age is beginning, and all is by no means well in the lives of the breadmakers. Catriona McNair's husband is making her life a misery and she decides to take drastic action; her friends Julie and Sammy have become involved in a search for a long-lost daughter; Alec Jackson, the happy-go-lucky reformed philanderer, finds himself caught up in one of Glasgow's worst tragedies; and the youngsters are challenging convention in the name of romance. 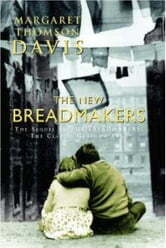 The New Breadmakers is the wonderfully evocative story of these and a host of other colourful Glasgow characters, as they live through the extraordinary changes of the 1950s and '60s. This book picks up where the third book of The Breadmakers Saga left off - and the pace doesn't slacken one bit. What I enjoyed the most, through the continuing stories of all the characters, is how they developed on so many different levels. New challenges present themselves but they have learned that the old ways aren't going to bring resolution. I felt that everyone (or nearly everyone) progressed a full turn up the spiral and found better and more positive ways to find their way through difficulties. It was great to have been able to read this immediately after the Breadmakers Saga.